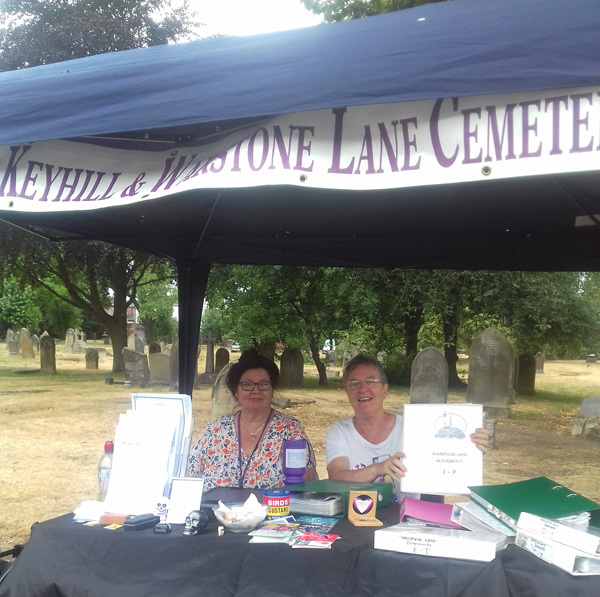 The Friends of Key Hill Cemetery & Warstone Lane Cemetery had two stalls at The Jewellery Quarter Festival on Saturday 21 July. Jacqui Fielding manned the stall for assisting the public with queries about the location of their ancestors and loved-one’s graves. She said: “This can be an emotional time for some”. Once the section and plot number had been found, Margaret Beauchamp and Colin Giles located the actual resting place. For the first time Helen Tubb manned the other stall that sold various books, novelty-bone shaped pens, Mexican Day of the Dead (All Souls Day) Key Rings and Bags. All to raise funds to restore the headstones in the Cemeteries. The ‘Friends’ gave two free guided Tours. The first tour was conducted by Steve Roden in Warstone Lane Cemetery at 12 o’clock, the other by Richard Beardall in Key Hill Cemetery at 2pm. They had a good turn-out and the public gave generous donations back at the stall. The ‘Friends’ met Robert Holland who is raising £10,000 to have a new grave for Major Thomas Henry Gem 1819-1881 known as Harry Gem (Co-founder of Lawn Tennis). Major Harry Gem is buried in Warstone Lane Cemetery Section P plot 1564. The ‘Friends’ gave a donation to Robert Holland to help with this Harry Gem project. The ‘Friends’ are appealing for the loan, or donation, of a gazebo for Heritage Open day in Warstone Lane Cemetery, Saturday 15 September. They may also require some help in erecting it. Whilst they have one gazebo for their records, another gazebo is required for their sales table. Jacqui told us they do not wish to spend money on another gazebo, when the money could be put towards the restoration of another headstone, so if someone, or an organisation, is willing to lend or donate one they will be eternally grateful. They enjoyed this short talk by Dennis Cluley and were able to inform him that Kathleen Dayus’ mother – Mary Ann Greenhill and sister Mary Ann White who were killed in an air raid on 10 April 1941 are buried in a private family grave in Warstone Lane – Section S, plot 852. Also, at the talk was Kathleen’s granddaughter Jackie Wright. 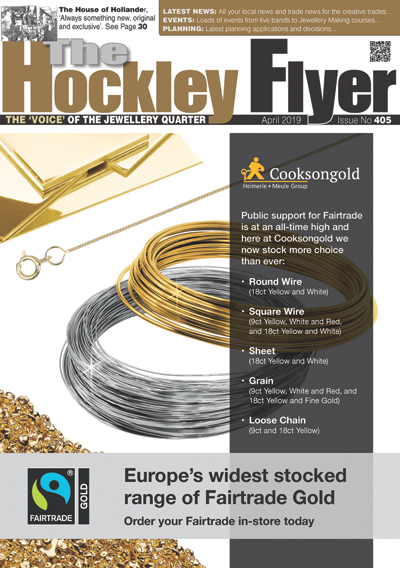 On a positive note ‘The Friends’ were busy and believe this was due to the event being advertised in the Hockley Flyer, Eventbrite, and the JQBIDS Festival Programme. ‘The Friends’ will be busy for the next few weeks chasing up enquiries. Sunday Guided Tours; 12 August – 9 September – 14 October – 11 November (Remembrance Day) – None in December. – Warstone Lane Tour -12 O’clock meet in Pitsford Street. Key Hill Cemetery – 2pm meet at island in Cemetery. Sat 8 Sept Time 10.30-4pm Birmingham & Midland Institute. Sat 15 Sept – 10.30-3.30pm Warstone Lane Cemetery – Stall corner Vyse Street & Pitsford Street – (We are hoping to obtain/borrow a gazebo for this event). Also, FREE Mini guided tours of Warstone Lane at 11am meet at stall Sat – Mini guided tours of Key Hill at 2pm meet at stall.